A few months after testing, my in-depth review for the Then I Met You cleansing duo is finally here. A sensorial experience, a scrumptious delight and two products packed with nutritious ingredients. Along with this review, I recently sat down with Charlotte Cho in her New York City head office to discover what jeong means to her. She acquainted those feelings when she introduced the sentiment of jeong when she launched Then I Met You. You can read the profile I wrote about her journey here. Then I Met You focuses on going deeper. It’s more than just a double cleanse. Side note: The cleansing duo is made for all skin types, cruelty free and vegan, free of sulfates, alcohol, parabens, artificial coloring and synthetic fragrances. What is it: A luxurious balm, oil cleanser that melts away oil-based impurities, makeup, sunscreen and excess sebum. What it does: Removes impurities while nourishing the skin with antioxidants, essential fatty acids and vitamin E.
Benefits and key ingredients: Seaberry/Sea Buckthorn oil is rich in stearic acid, oleic acid, linoleic acid, and omega-6 which are all fatty acids. From TIMY: The bright orange coloring is due to high lycopene and carotenoid content. With time the coloring will fade but does not diminish the effectiveness of the cleanser. Olive oil is a nourishing antioxidant that has anti-inflammatory and anti-aging benefits. Together, olive oil and sea buckthorn help restore the skin barrier. Persimmon extract brightens the skin. It’s a radical scavenger that prevents premature aging and photo damage. Grapeseed oil nourishes the skin while removing oil-based impurities in a gentle way. Vitamin E is a healing ingredient and is an essential component to healthy and nourished skin. It also has a ton of antioxidant properties. View the full ingredient list here. Texture and scent: This is a sorbet-soft balm cleanser that smells like a mango sorbet. Hints of rosemary, persimmon and grapefruit add to the aromatic experience. How to use: As your first step of the double cleanse, Then I Met You recommends to take the spatula and use a dime sized amount onto dry skin and gently massage to melt away the makeup. The best way to remove an oil based cleanser? Emulsify it with warm water to properly wash everything away to prepare for your second step water based cleanse. My experience: The Living Cleansing Balm is one of the most unique cleansing moments I’ve ever experienced so far. The second I opened the tub, I gasped. The colour, the decadent texture and the scent. It all just made sense. I remember taking the spatula and went deeper like it told me to. Melting everything onto my skin, the texture was the first thing I felt the most. It’s just… beautiful. It’s smooth and it’s juicy, it’s a delight. It feels like a mango sorbet. Pure silk. The Living Cleansing Balm has become one of my favourite first cleanses. It removes ALL my makeup so effortlessly. It’s not like a typical balm cleanser. I can directly apply it to my skin without even having to rub it into my hands. It’s not chunky, it doesn’t crumble up and it just feels like a dream. Even if I’m not wearing makeup, using it on bare skin is such fun experience. It’s super nourishing and soothing, unlike any other oil based product I’ve ever tried. Details: C$51.00 approximately converted / USD$38.00 for 90 g / 3.17 oz | Available at Then I Met You | Comes with a spatula. What is it: A gel cleanser with a jelly texture to soothe the skin. What it does: Soothes, softens and awakens your skin. Followed as a second cleanse, it’ll also help remove the excess impurities from the first oil cleanse along with water based impurities. Benefits and ket ingredients: Licorice root extract is a gentle and effective antioxidant to help even out your skin tone and and reduce free radicals. Green Tea is used as an anti-inflammatory oil packed with essential fatty acids. Rice ferment filtrate is rich in enzymes and amino acids as well as brightens the skin. Tea Tree Leaf is an herbal antioxidant with antimicrobial properties that’s commonly used for spot treatments and is gentle enough for acne-prone skin. 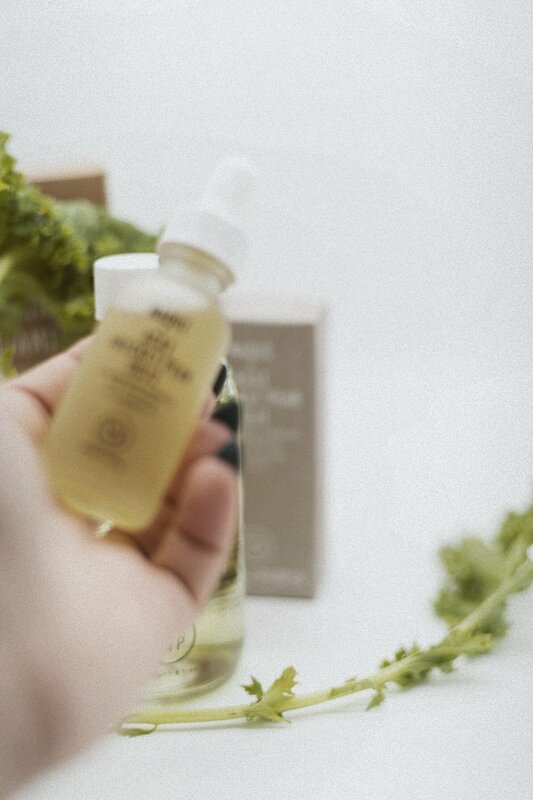 Centella Asiatica in an antioxidant-rich ingredient made up of asiatic acid, madecassic acid, and madecassoside and several other actives. Centella Asiatica is wound-healing and moisturizing. Gluconolactone (PHA) is a gentle acid with exfoliating, moisturizing and antioxidant factors without sensitizing the skin. View the full ingredient list here. Texture and scent: This cleanser is a fun, bouncy, stretchy, yummy cleanser that smells like tea. Like Charlotte says, it really does awaken your senses. How to use: As the second step of your double cleanse, squeeze out a pea-sized amount on wet hands and gentle massage into your skin, removing all the water based impurities. My experience: You’re unique in all your beautiful, jelly glory. The Soothing Tea Gel has become one of my favourite cleansers. You know, cleansers in general have become so fun to me, especially when they’re packed with such delicious ingredients like this one. From the texture to the gentle foam, which is barely there at all, this cleanser is scrumptious. It’s super gentle for morning and evening, waking my skin up and instantly evening my skin tone. It’s super soothing and gentle feels SO refreshing. It quenches my skin, makes me feel alive and smells really delightful. It’s currently my go-to! Overall thoughts: I love the cleansing duo together and apart. The day Charlotte launched the line, I ordered it in a heartbeat. The concept is brilliant, her story is lovely and the ingredients are just awesome. I do think they’re a little on the “luxe” and pricey side, but that’s subjective to everyone. I say luxe because of the price point, but regardless of a price point, any skincare product should feel luxurious as long as it makes you feel happy and alive. And the cleansing duo does. It’s more than just cleansing. More than a routine. It’s jeong. I truly look forward to Charlotte’s skincare journey and growth with Then I Met You and all her other endeavours to come. You can shop the cleansing duo together here or individually. After testing every product from Youth To The People, I thought I’d write a review on each one individually. There are currently 7 products in the line, ranging from a cleanser, serum, creams and an oil. You’ll notice that kale and spinach are two of the most common ingredients used in their products. Their two latest launches include some new and interesting ingredients that set them apart. Buckle up, because I’m about to start cold-pressing. Side note: All products are made with 100% vegan ingredients, cold-pressed extracts, recyclable packaging, made in USA, no animal testing, no parabens, no phthalates, no sulfates. What is it: A daily gentle face wash powered and formulated with cold-pressed ingredients and antioxidants. Essentially, a green juice cleanse for your face. What it does: Cleanses skin without stripping or drying your skin barrier, balancing the pH levels. It works to prevent build up from free radicals all the way to dirt in the pores, removes makeup and nourishes the skin. Custom Superfoods Blend: Kale, Spinach, Green Tea, Alfalfa, Vitamins C, E, K | View full ingredient list here. Benefits and key ingredients: Kale is rich in phytonutrients and vitamins C, E and K. A phytonutrient is a substance found in certain plants, believed to help prevent certain diseases and has health benefits. Spinach will help soothe the skin and boosts the skins high natural moisture content. It also has cooling properties. Green tea is used as an anti-inflammatory oil packed with essential fatty acids. Texture and scent: This is a gel cleanser with a fresh, clean and herbaceous scent. My experience: I never did morning cleanses until I tried this cleanser. My skin type is normal, and since I do a lengthy routine in the evening I find it unnecessary to do one in the morning. (This cleanser is also great for any skin type!) With this cleanser, it’s just different. In the morning, I’ll spray my face with mineral water, pour a little cleanser into my palm and gently massage until the gel starts to lather. I then wash it off with cold water, and it is THE most refreshing skincare moment I have in the morning. I look forward to you. You instantly brighten me. You make my mornings ten times happier. You take care of me by making sure there isn’t any dirt or free radicals just laying around on my skin. To cut it to the point, I love you with all of me and I’m thankful to have you in my life. You really are a glass of freshness, crisp greens and water for my face. (It’s also amazing as a second cleanse. I personally wouldn’t use it to take off makeup because I double cleanse with an oil cleanser and follow up with a water or gel based cleanser!) It’s one of my favourite cleansers ever. Details: C$45.00 / USD $36.00 for 8oz/ 237 mL | Available on YTTP and Sephora | Comes with an pump. What is it: A super serum, high-performance elixir that illuminates the skin with age defying antioxidants. The Hyaluronic Acid will also plump and brighten the skin. What it does: Brightens, plumps and firms the skin. Benefits and key ingredients: Tripeptide 5 is a peptide complex that will visibly help improve the appearance of fine lines and wrinkles. Peptides are tiny proteins and active molecules which have anti-aging benefits and derive from collagen broken down into amino acids. The crosslinked Hyaluronic Acid will aid the skin in keeping its moisture and leave the skin plumped. Casually known as a natural hydrator. The chelated Vitamin C is an essential antioxidant for the skin which will prevent the skin from aging and counteract the effects of pollution and free radicals. Texture and scent: This is a light gel serum with no scent. My experience: A definitive yes. It does exactly what it says. Plumps, brightens and firms the skin without leaving it tight. It’s super lightweight and effective. I personally haven’t used it in the morning, but in my experience, using it at night works great for me. I wake up and my skin feels smooth and balanced. Always remember to wear SPF especially if a product has some sort of Vitamin C derivative. Your skin will be more susceptible to sun damage. I’d recommend this to anyone who’s getting into serums and wants something simple and effective. Details: C$74.00 / USD $62.00 for 1oz/ 30 mL | Available on YTTP and Sephora | Comes with a pump. What is it: A superfood mask to reset the skin by instantly balancing and restoring dull and tired skin. What it does: Resets your skin from environmental stressors and free radicals. It’ll detoxify and hydrate the skin, too. Benefits and key ingredients: Spirulina is a sea-based superfood packed with phytonutrients along with vitamins K and B12. Microalgae is a nutrient-rich source packed with exfoliating enzymes and essential minerals. It’ll speed up cell turnover. Kale is rich in phytonutrients and vitamins C, E and K.
You win. This mask is lovely to apply and remove. I wouldn't even consider it a clay mask for how soothing and moisturizing it is. It’s difficult to find a clay one that doesn’t tighten up the skin or dry it out, but this one truly feels like a buttery, moisturizing dream. I see instant results of a balanced glow, um, hi, hello. Here for it. The ingredients, though. Living for the microalgae! Safe to say, it’s the best clay mask I’ve ever tried to date. Details: C$55.00 / USD $44.00 for 2 oz/ 59 mL | Available at YTTP and Sephora | Comes with a spatula. What is it: A nourishing eye cream that delivers vital nutrients to the skin. What it does: Nourishes the under eye area with restorative vitamins, superfoods and peptides. Benefits and key ingredients: Kale is rich in phytonutrients and vitamins C, E and K. Aloe is a super gentle and acts as a lightweight skin-soother that has cooling and soothing properties. It boasts a high natural moisture content. Sunflower oil is anti-inflammatory packed with essential fatty acids. EFAs are critical in keeping the skin hydrated and plump. How to use: Youth To The People recommends applying a small amount of cream around the eye area. (My tip: Always make sure to apply eye creams with your ring finger! It’ll apply the cream with the softest pressure in such a delicate area. Also, make sure you’re applying the eye cream in the proper area. Applying face cream in the eye area when it’s meant for the rest of the face can cause milia!) The cream is formulated to be the ideal primer for under concealer! Wait for it to absorb and follow with concealer. Texture and scent: This is a smooth and rich eye cream with a light, clean and herbaceous scent. My experience: I’m on this sunflower oil energy. Can we get more? Yeah, I love it. Man, the more I write these reviews the more I realize YTTP hasn’t let me down. Eye creams can often be frowned upon but I’m here for this one. Just as much as it’s here for ME. I’ve been using preventative skincare for a couple of years now, so I don’t have any fine lines or wrinkles, but this cream almost instantly de-puffs and nourishes my under eye area as well as diminish ANY sort of fine lines. The next morning, my under eye area looks TEN times smoother than it did the day before. It’s lovely. I really they nailed this one. Ingredients and all. If you’re looking for an eye cream that isn’t gimmicky and does what it says, go for it. It’s not this scary, anti-aging commercial miracle. It’s simple, effective and clean. What is it: A lightweight, air-whipped moisture cream. What it does: It restores, balances and conditions the skin with Hyaluronic Acid. Benefits and key ingredients: Kale is rich in phytonutrients and vitamins C, E and K. Green tea is used as an anti-inflammatory oil packed with essential fatty acids. Hyaluronic Acid will help the skin retain moisture and act as a natural hydrator. How to use: Youth To The People recommends smoothing a dime-sized amount of cream onto the skin until fully absorbed. It can be used morning and evening. Tip: Use the cream as a makeup primer or even mix it with your foundation! I have to say, it works wonders as a primer. Side note: It’s great for all skin types but best for combination/oily. Texture and scent: This is a air-whipped gel cream with a light, clean and herbaceous scent. My experience: I’m getting emotional. This cream was one of the first to be curated in my collection when starting my skincare journey. I remember buying the Superfood Youth Duo Mini and feeling all the excitement in the world. To this day, it’s truly one of the loveliest creams I’ve tried. I say lovely because of how delicate it is. It’s… It feels blurring. I can’t even describe it. It’s beautiful in the morning, leaving my skin refreshed and plump. Ugh. The best way I’d describe it? A sweet, gel-like, ultra-light marshmallow whipped, blurring dream. I’ve recommended this cream to countless amounts of people and received nothing but good feedback. If you’re looking for an everyday moisturizer, add this to your cart. Details: C$59.00 / USD $48.00 for 2 oz/ 59 mL | Available at YTTP and Sephora | Comes with a spatula. What is it: A deeply moisturizing cream with adaptogenic mushrooms and herbs to soothe the skin and adapt to skin stressors. What it does: It soothes and calms the skin down with adaptogenic mushrooms and herbs when facing everyday stressors like UV rays and environmental pollutants. Proprietary Adaptogen Blend: Ashwagandha, Rhodiola, Reishi, and Holy Basil. View full ingredient list here. How to use: Youth To The People recommends to apply the cream on cleansed skin every morning and evening. Works great after using the Superberry Hydrate and Glow Oil and Superfood Firm and Brighten Serum. Tip: The cream works wonders when used on freshly cleansed skin or simply on its own. Texture and scent: This is a soothing cream with no added scent or fragrance. To me, it feels like a dream. It’s like a creamy cloud and butter on toast took shrooms and created a cream. My experience: You’re beautiful in all of your soothing glory. You adapt to me in the most soothing, creamy way. You feel so light and you apply so delicately. You want to taste me? Adapt to every part of me. I’d like to explore every euphoric part of you. This is truly one of the best creams on the market. It’s all everyone’s talking about and that’s how it should be. My cheeks are prone to redness, from my youth all until present day. This cream truly helps with diminishing the redness. Adapts to my skin. Soothes it and keeps it moisturized from morning until night. And I love using it morning and night. If you have a lot of redness and your skin feels stressed, this one’s for you. Details: C$70.00 / USD $58.00 for 2 oz/ 59 mL | Available at YTTP and Sephora | Comes with a spatula. What is it: A lightweight, ultra enriched and flash absorbing facial oil that harnesses the nutrients of rare super berries and nourishing ingredients. What it does: Hydrates and illuminates the skin with unique ingredients to illuminate, hydrate and revive the skin. Custom Superberry Blend: Maqui, acai, prickly pear, goji berry, sunflower, jojoba, moringa and squalane. View full ingredient list here. Benefits and key ingredients: Maqui is the most antioxidant dense fruit in the WORLD. It’s a rare superberry that’ll help fight free radicals. Acai is rich in omega 3, 6 and 9 fatty acids which will help revive dry and dull skin. Prickly pear is an extremely hydrating ingredient that helps ease apparent and subtle signs of redness. Goji is also rich in antioxidants, essential fatty acids with vitamins C and E. It helps fight free radicals as well as softens the appearance of fine lines. How to use: Youth To The People recommends to apply the oil after cleansing. Applying 2-5 drops of oil onto hands, rub together and press into the skin. (I personally think 2-3 go a long way!) Great for morning and evening. Tip: Mix the oil into foundation or even contour sticks! It’ll leave the prettiest glow. Texture and scent: This is a lightweight oil with a bright, fruit and juicy scent. I’ve never tried anything like it. It’s ethereal. Can I even describe a product like that? I sure just did. It’s just… It stands its own ground. The Superberry oil is so nourishing and melts into the skin so seamlessly. It’s not heavy and doesn’t feel greasy. This oil is ideal for everyday applied alone or with your favourite moisturizer. A little goes a long way which is so worth it in the long run if you’re using it daily. And the scent… the scent! It’s just so gorgeous. My skin literally craves this oil ever since I started using it. My overall complexion looks brighter, healthier and glowing from within. It also moisturizes the heck out of my skin, leaving it smooth and glistening. Also, the ingredients? Really? Youth To The People really did that. It’s an experience, to say the least. I discovered Youth To The People a little over a year ago and I’ve fallen in love since the first moment I tried their products. Their mission and dedication to deliver skincare that ties in science and superfoods intrigued me and to this day still does. They’re different. I recently had a beautiful conversation with YTTP’s cofounder, Greg Gonzales, and decided to write a profile on him and the company. Read it here. You are youth. You are loved. Disclaimer: The Superfood Cleanser, Superberry Hydrate and Glow Oil and Adaptogen Cream were gifted to me from the brand. All images and content found on Desseydoll are from the garden of roses that she has planted in her brain, which continue to blossom day by day.